There are many ways to spend the day after Thanksgiving. Some decorate for the holidays, some work, some sleep-in and wonder how they ate so much the day before, and others take part in the great American tradition known as Black Friday – the unofficial kick-off to the holiday season when millions of Americans race to the stores for shopping sales. If the name sounds ominous to you, you’re not mistaken. It was coined by the Philadelphia Police in 1966 to describe the horrible traffic jams and store crowding that take place on that day. But whether it’s one of your favorite holiday traditions or sounds like your worst nightmare, there’s no denying that Black Friday shopping is a true cultural phenomenon. Get a good night’s sleep. Sound obvious? Sure, but we’re talking about the holidays – so doing some pre-planning to ensure you get enough sleep is a good idea. Black Friday shopping is not for the weary! Another way to get to bed earlier? Use S.O.S® to tackle the Thanksgiving dinner pots and pans, getting you out of the kitchen and into your bed as quickly as possible. Start early. Many of the best Black Friday deals are first-come-first-served, which means they sell out early. If you’re shopping for a specific gift item, you may want to have a Plan B in mind, as even the earliest starters often miss out on the huge “doorbuster” deals. Check prices ahead of time. Black Friday deals can be great, but sometimes online retailers will actually beat these prices – without the crowds! Check store hours and sale dates. For better or worse (we won’t get into that debate), more and more stores are opening a day early, starting their Black Friday sales on Thanksgiving Day. So if there is a particular item you are really hoping to buy, you may need to start shopping even earlier. Create a plan, including driving routes, shopping lists and firm spending limits. The best shoppers have a detailed plan of attack that lets them visit the most stores, snag the best gifts, and not find themselves in a mountain of debt come January. Check Trends. 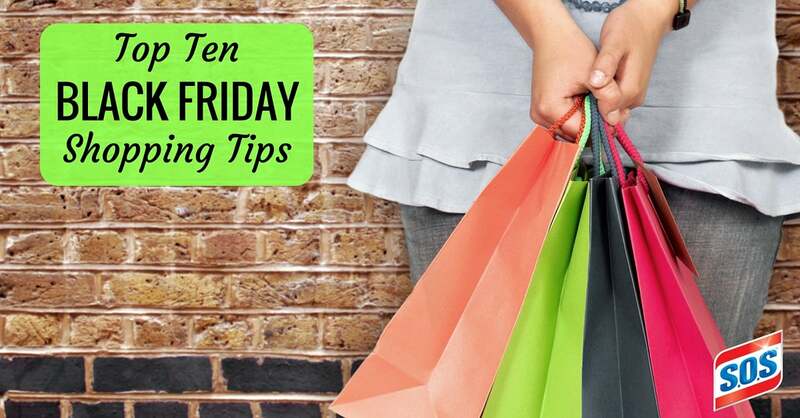 According to Kiplinger, the best things to buy on Black Friday include cookware, HDTV’s, laptops, tablets, small appliances, video game consoles and wearable technology such as fitness bands and smart watches. On the other hand, according to DealNews, some of the worst things to buy on Black Friday are home and patio furniture, exercise equipment, vacation packages, brand name Smart TVs, tools, designer clothing and winter gear. Do a little research and plan accordingly! Bring Proof. Take store ads with you or snap a picture of specific ads with your cell phone. This way if there is a price discrepancy, or you’re visiting a store that has a price-match policy, you have proof on-hand of the best deals. Read Reviews. Do at least some product research ahead of time, especially on big ticket items. Read consumer and expert reviews to make sure the product you’re after is really worth your shopping time and energy. Check store return / exchange policies. Stores will sometimes shorten their return window during this season or even designate Black Friday sales as final. Be sure you understand the terms of sale. Wear comfortable shoes, bring snacks and water, and find a friend to join you! Waiting in long lines is a lot more tolerable when your stomach isn’t rumbling and you’ve got a friend by your side to share in the people watching. 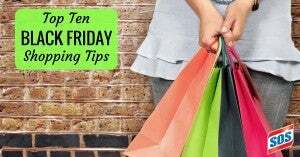 Do you have any tips, tricks or traditions specific to Black Friday shopping? We’d love to hear them! Use the comments section of this blog or post your thoughts to the S.O.S® Facebook page. Don’t forget to follow us on Twitter, Pinterest and Instagram, too! I always get very organized a couple of days before. One of the things I do is collect coupons the few weeks leading to BF. As I plan my route, with sale adds in hand, I’ll attach my coupons to flyer they belong to. That way all I have to do is grab my list and flyer/coupon, and I’m ready to hit the store. My sister and I love Black Friday, and we are already making plans for this year and looking for good shopping centers to visit. Thanks for your tip to create a budget of how much you are willing to spend. I also like how you said that you should read all the reviews on the places you are wanting to visit ahead of time too.